Liquefied gases are used in all different types of industries. Gases such as argon, boron trichloride, carbon dioxide, helium, hydrogen, nitrogen, oxygen, and others are often used in the semiconductor and petrochemical industries. Natural gas is used to cook and heat in many of our homes. However, most of the liquefied gases used in these industries are used in minute amounts, and must be stored in bulk for use. In order for companies to maintain an accurate track of the available amount of liquefied gas, a high quality industrial scale must be used. Typically, our Series 620G Gas Cylinder Scale is most often used in these scenarios. If you’re looking for a company to turn to who can offer advice as to the best scales to use for weighing liquefied gases, you need look no further than Arlyn Scales. Arlyn Scales has been an industry leader in the design and manufacturing of high quality, industrial scales for more than 30 years. Not only are we able to develop cutting edge scales that are able to stand up to the harshest industrial environments, but we’re able to do so at a price that is affordable for even the most price conscious facilities. At Arlyn Scales, we’re able to keep our costs down and quality up due to our unique model of designing and manufacturing all of our scales and subassemblies in our own factory. Headquartered in Long Island, New York, Arlyn Scales designs and manufacturers all of our scales in the U.S. This gives us a significant advantage over many of our competitors who may choose to design their scales domestically, but often do all of their manufacturing overseas. Think about the disconnect that can exist between a design team in the U.S., and a manufacturing team overseas? At Arlyn Scales, the only thing separating our design and manufacturing teams is a short walk from one end of our facility to the other. An additional benefit of Arlyn’s U.S. based manufacturing capabilities is that we’re also able to sell our products factory direct to our customers. No longer do customers have to deal with distributors and middlemen. If you ever have a problem with one of our scales, you can simply pick up the phone and speak with one of our scale experts. Furthermore, by selling our scales factory direct, we’re able to provide the highest level of scale quality at an extremely competitive price compared to our competitors who have to deal with excessive freight and quality control issues that are synonymous with overseas manufacturing. 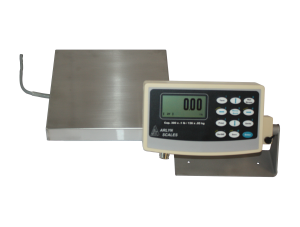 Why Choose an Arlyn Scales Weighing Instrument? In addition to the reasons listed above, our scales can speak for themselves when it comes to quality. Below are just a few of the reasons why many of our customers continue to turn to Arlyn Scales for all of their industrial scale needs, especially when they involve weighing liquefied gases. One way that many of our competitors drive down the price of their scales is by using inferior scale materials, especially in the case of their load cells. At Arlyn Scales, we use stainless steel load cells that can stand up to the rigors of being exposed to liquefied gases. As one of the most important components of any scale, stainless steel load cells ensure that our cylinder scales are durable and accurate, for a variety of taxing industrial conditions. In addition to the stainless steel load cells, we took the concern for durability a step further with the use of stainless steel platforms as well. Our stainless steel platforms are extremely easy to clean as well as non-corrosive. Should your scale be exposed to a large amount of harsh chemicals, you can elect to add our triple epoxy coating with mica particles. This coating further protects your scale from exposure to harmful acids, chemicals, gases and solvents. When you choose the 620G Gas Cylinder Scale from Arlyn Scales you have a variety of capacity options. We offer our Gas Cylinder Scales with capacities of 60 lbs., 300 lbs., or 400 lbs., depending on your unique needs. This allows you to choose a scale that can meet the needs of your facility now, as well as into the future. Hauling around gas cylinders can be quite difficult. For this reason, we’ve designed a platform that is 9.25” X 9.25”, making it optimal for weighing cylinders, yet is only 1 3/8” high. This makes loading and unloading heavy gas cylinders extremely easy. If you’re in need of a larger platform for bigger cylinders, we also offer a 14” X 14” stainless steel platform. In addition, we can further modify a smaller or larger platform for your unique needs. We can customize your scale in a variety of areas including the frame, protective coatings, type of digital indicator, and much more. Reach out to our customer service team today to learn more about the many ways that you can customize one of our scales to use when weighing liquefied gases. Another new feature of our industrial scales is our UpScale Touchscreen Indicator, which can replace the typical digital indicator that you’re likely used to seeing when interacting with a scale. Our touchscreen indicator is powered by a quad core processor, and utilizes a 7” HD IPS display. This Android based tablet offers all of the functionality you’re used to in a simple display indicator, as well as a variety of additional features at your fingertips. At Arlyn Scales, we think that one of the best features of our high quality industrial scales is the support that comes before, during and after the sale. We’ve been here for our customers for more than 30 years, and don’t plan on going anywhere anytime soon. If you have any questions about weighing liquefied gases, or any other industrial materials, don’t hesitate to reach out to our team of scale experts today at 800-645-4301. We look forward to hearing from you very soon.